I have one card of Bob Beall, from 1979 Topps. Playing career: First baseman Bob Beall played for the Braves and Pirates from 1975 to 1980. In 148 games he hit .231 with 1 HR and 18 RBI. Where he is now: He retired after a long career at Nike in 2009, culminating as Director of Planning for Jordan Apparel. He is now a board member for the Hillsboro Schools Foundation in Oregon. Google Autocomplete results: He is first when you type Bob Beal, ahead of Bob Beale, former CEO of Comtrol. The first entry when you type Bob Beall is not the ballplayer but the CEO of the Cystic Fibrosis Foundation. Coming up next: The next profile will be T.J. Beam. I have three cards of Brandon Beachy. This one is from 2011 Topps. Playing career: Brandon Beachy came up with the Braves in 2010, and became a part of their starting rotation in 2011. He has pitched pretty well for the Braves but has been hampered by numerous injuries. Where he is now: In five starts in 2013, Beachy went 2-1 with a 4.50 ERA. My memories: The Braves are one of those teams whom you always hear about their prospects. I’d heard the name a lot and thought he was a bigger star then it looks like he actually is. He’s already 27 so not a lot more time to get over the injuries and live up to his potential. Google Autocomplete Results: He is first when you type Brandon B, ahead of Brandon Boyd, the singer for Incubus. There do not appear to be any other prominent Brandon Beachys. Coming up next: The next profile will be Bob Beall. I have one card of Shane Bazzell, from 2003 Donruss Rookies. Playing career: Shane Bazzell pitched eight seasons in the Athletics and Rangers organizations. Two of those seasons were great (10-4, 2.73 in 2001 at Modesto; 15-3, 3.03 in 2004 at Midland). However, the rest of his career was decidedly mediocre. Where he is now: In 2010, a year after being named baseball coach at Starkville Academy, Bazzell was arrested by the Mississippi Bureau of Narcotics with four felony counts of obtaining Adderall by fraud. There have been no press mentions of Bazzell since. Google Autocomplete results: He is first when you type Shane Baz, ahead of Shane Bazer, a young man from Nebraska who died last year. There do not appear to be any other prominent Shane Bazzells. Coming up next: The next profile will be Brandon Beachy. I have one card of Yorman Bazardo, from 2005 Topps. Playing career: Yorman Bazardo pitched for the Marlins, Tigers and Astros from 2005 to 2009. In 25 games he went 3-4 with a 6.86 ERA. Where he is now: Pitching for Rimini in Italy. In seven regular season games he went 4-0 with a 2.59 ERA. Last week he pitched 6.1 scoreless innings in the team's Game One win in the IBL Series. Google Autocomplete results: He is ninth when you type Yorm, between Yormak, referring to Dr. Jeffrey Yormak, an orthopedic surgeon, and Yormark Wedding, referring to the recent nuptials of the CEO of the Brooklyn Nets. Coming up next: The next profile will be Shane Bazzell. I have 45 cards of Don Baylor. This one is from 1986 O-Pee-Chee. Playing career: Don Baylor played nineteen seasons in the major leagues, starting as an outfielder but quickly transferring to DH once the new position was established. He had over 2000 hits and 300 HR, and won the AL MVP in 1979 with the Angels, leading the American League in both runs scored and RBI. An eight-time AL leader in being hit by pitch, and held the career record for over twenty years. My memories: As a Yankee fan I was always annoyed by Baylor. He played for six teams, and the only one he didn’t help lead to the playoffs was the Yankees. The Yankees traded him to the Red Sox before the 1986 season, and he provided veteran leadership to get them to the playoffs for the first time in eleven years. The next year, Boston traded him to the Twins, providing veteran leadership to get them to the playoffs for the first time in sixteen years. The next year, He signed with Oakland, providing veteran leadership to get them to the playoffs for the first time in seven years. Where he is now: Baylor has coached for several teams and managed the Rockies and Cubs for nine years. Though he had just a .476 winning percentage as a manager, he did lead the Rockies to their first playoff appearance in 1995. He is currently the hitting coach for the Arizona Diamondbacks. Interesting stories: Baylor was diagnosed with Multiple Myeloma since 2003. The average survival rate is five years, which he has already doubled. He was helped by former Yankee Mel Stottlemyre, who was diagnosed in 2000, and who introduced Baylor to some doctors at Sloan Kettering Hospital. Baylor and Stottlemyre are currently doing fundraising for research on the disease. In 1962 Baylor was one of three children to integrate O. Henry Junior High School in Austin, TX. In 1963, he was a high school classmate of Sharon Connally, whose father John Connally was governor of Texas and was shot when President John F. Kennedy was assassinated. Baylor was in class with Sharon when Secret Service agents pulled her out of school to tell her that her father was shot. The class was actually scheduled to leave school early to see the President speak later that day. After graduation Baylor had a scholarship offer to be the first black football player at the University of Texas, but he chose to sign with the Orioles instead after coach Darrell Royal would not permit Baylor to keep playing baseball. In 1990, Baylor wrote an autobiography called Nothing but the Truth. Ironically, it has mostly negative reviews on Amazon in part because of many inaccuracies in the book. One reviewer also accuses Baylor of messing around with Maury Wills’s wife. Google Autocomplete results: He is ninth when you type Don B, between Don Bosco Prep Football, the number one high school football team in the nation in 2011, and Don Best, a sports betting service. There do not appear to be any other prominent Don Baylors. Coming up next: The next profile will be Yorman Bazardo. I have three cards of Jonah Bayliss. This one is from 2006 Upper Deck First Pitch. Playing career: Jonah Bayliss pitched for the Royals and Pirates from 2005 to 2007. In 61 games, all in relief, he went 5-4 with a 6.75 ERA. Where he is now: He owns the A1 Pitching Academy in Adams, MA. He also writes a baseball instruction blog, JB’s Bayzball. Interesting stories: On one of his minor league teams, the mascot would drive around the warning track on an ATV every game. To break up the monotony of what he would call “Groundhog’s Day”, he would harass the mascot by doing things like put a beach chair on the warning track and pretend to fall asleep. Bayliss is a big fan of Yoda as a pitching instructor, using him as an example on both his blog – A Jedi Throwing Program - and on Facebook: "when the more rotational, you become, with potential energy, the more linear our kinetic energy must be." Google Autocomplete results: He is ninth when you type Jonah Ba, between Jonah Bayer Twitter, referring to a music journalist, and Jonah Bad Luck, referring to how the prophet Jonah was a symbol of bad luck to sailors. There do not appear to be any other prominent Jonah Baylisses. Coming up next: The next profile will be Don Baylor. I have 26 cards of Jason Bay. This one is from 2007 Topps. Playing career: Outfielder Jason Bay made his major league debut with the Padres in 2003. He played in three games for San Diego before being traded to Pittsburgh for Brian Giles. Bay essentially replaced Giles as Pittsburgh’s one good power threat, hitting 114 HR over the next four seasons. In 2008 it was Bay’s turn to get traded to a contender, and his trade to Boston helped make him a big star, as he had a huge season with Boston in 2009, garnering a lot more press attention than he had in small-market Pittsburgh. After the 2009 season, he signed as a free agent with the Mets, and his power completely disappeared with the move to cavernous Citi Field. In his three seasons with the Mets he combined to hit 26 HR, a number he had topped in five of the six previous single seasons. Where he is now: Bay signed with Seattle in 2013, another large-ballpark team, but was unable to re-establish himself as a quality major league hitter. In 68 games he hit just .204 with 11 HR and 20 RBI, and was released in August. My memories: He sure seemed like a big star with Boston. I wonder if he had stayed in Boston he would still be hitting 25-30 HR a year. All you hear about the last few years is what a disappointment he has been. Interesting facts: His sister Lauren is a two-time Olympian softball player from Canada. Google Autocomplete results: He is third when you type Jason B, between Jason Biggs, an actor, and Jason Bourne, a book/movie character. Another prominent Jason Bay is a DJ. Coming up next: The next profile will be Jonah Bayliss. I have one card of Jim Baxter, from 1991 Line Drive. Playing career: Catcher Jim Baxter played six seasons in the Indians, Tigers and Royals organizations. In 309 games he hit .228 with 12 HR and 81 RBI. Where he is now: Anyone know where Jim Baxter is now? Google Autcomplete results: He is first when you type Jim Bax, ahead of Jim Baxter Emirates, referring to an airline executive. There are no references to the baseball player on the first page of Google results; the first entry is a Scottish soccer player. Coming up next: The next profile will be Jason Bay. I have one card of Ramon Bautista, from 1991 Line Drive. Playing career: Infielder Ramon Bautista played six seasons in the Indians organization. In 494 games he hit .232 with 10 HR, 132 RBI and 70 SB. Where he is now: Anyone know where Ramon Bautista is now? Google Autocomplete results: He is first when you type Ramon B, ahead of Ramon Bruin, an artist. There are no references to the ballplayer on the first page of Google results; most refer to a Filipino actor. Coming up next: The next profile will be Jim Baxter. It amazes me that there are some basic Yankee cards from junk-wax era sets that I still don't have yet. Melido was not as flashy as his brother but was the Yankees best pitcher in the early 1990s. Speaking of 1992 Studio, remember that card of Jose Lind with a sword? Here he is on the field with a large hunting knife! Apparently Lind was known for having a large collection of knives that he kept in his locker and sometimes brought out onto the field. I have eight cards of Jose Bautista. This one is from 2011 Topps. Playing career: Outfielder Jose Bautista came up in the major leagues in 2004, and played with four teams that year – the Orioles, Devil Rays, Royals and Pirates. He stuck with the Pirates, primarily as a third baseman, for a few years, showing some power, hitting at least 15 HR for three straight seasons. He was traded to the Blue Jays in 2008 and had a mediocre 2009 with Toronto, who moved him back to the outfield. Teammate Vernon Wells suggested a change to Bautista’s swing late in the 2009 season, and it paid off tremendously. Bautista led the AL in home runs in 2010 and 2011, including 54 in 2010 when he became a major star. He has been an All Star each of the last four seasons, but has lost significant time due to injury in 2012 and 2013. Where he is now: His season ended in mid-August due to bone bruise in his left hip. In 118 games he hit .259 with 28 HR and 73 RBI. My memories: He seemed to come out of nowhere in 2010 and has become a big star. Certainly a consistent thorn in the Yankees side. Interesting facts: The Bautista Family Education Fund helps young Latin American ballplayers adapt to life in the US and Canada while attending college and playing baseball. Google Autocomplete results: He is fifth when you type Jose , between Jose Canseco, the former A’s outfielder, and Jose Fernandez, the Marlins pitcher. Coming up next: The next profile will be Ramon Bautista. I have 22 cards of Jose Bautista. This one is from 1994 Score. Playing career: Jose Bautista pitched nine years in the major leagues for the Orioles, Cubs, Giants, Tigers and Cardinals. His best season was 1993 when he went 10-3 with a 2.82 ERA for the Cubs. Where he is now: Pitching coach for the Kannapolis Intimidators in the White Sox organization. Interesting facts: Bautista is an observant Jew who did not play on the High Holy Days. His maternal grandfather was an emigrant to the Dominican Republic escaping Nazi persecution during the Holocaust. Bautista later married an Israeli emigrant to Venezuela and has expressed a desire to build a synagogue in the Dominican Republic. Google Autocomplete results: Jose Bautista Pitching Coach is seventh when you type Jose Bautista P, between Jose Bautista Pirates Stats and Jose Bautista Prancersise, both of which refer to the current outfielder of the same name. Coming up next: The next profile will be the outfielder Jose Bautista. I have five cards of Denny Bautista. This one is from 2006 Upper Deck. Playing career: Denny Bautista pitched for six major league teams from 2004 to 2010. In 131 games (21 starts) he went 11-15 with a 4.23 ERA. Where he is now: Pitching for the Hanwha Eagles in Korea.In 26 games this season he is 6-7 with a 4.12 ERA. He last pitched on Saturday, giving up two runs in five innings against the Samsung Lions. Interesting facts: He is a second cousin of former Red Sox pitcher Pedro Martinez. My memories: I would hear of him and would automatically think of Danny Bautista. I would think of him as an outfielder as a result and not a pitcher. Google Autocomplete results: He is fifth when you type Denny Ba, between Denny Backhaus, a graphic designer, and Denny Bales, a Texas jeweler. There do not appear to be any other prominent Denny Bautistas. Coming up next: The next profile will be Jose Bautista (the pitcher). I have 20 cards of Danny Bautista. This one is from 2005 Topps. Playing career: Outfielder Danny Bautista played twelve years in the major leagues for the Tigers, Braves, Marlins and Diamondbacks. In 895 games he hit .272 with 62 HR and 319 RBI. My memories: I was aware of him when he came up with Detroit, but lost track of him after he moved to the National League. When he faced the Yankees in the 2001 World Series I had forgotten all about him. Unfortunately he had great success against the Yankees, hitting over .500 in the series. Interesting facts: His stepfather, Jesus de la Rosa, played for the Astros in 1975. Where he is now: Anyone know where Danny Bautista is now? Google Autocomplete results: He is first when you type Danny Bau, ahead of Danny Baudoin Baseball, referring to a pitcher at Horace Mann High School in New York. There do not appear to be any other prominent Danny Bautistas. Coming up next: The next profile will be Denny Bautista. I have nine cards of Ross Baumgarten. This one is from 1983 Fleer. Playing career: Ross Baumgarten pitched for the White Sox from 1978 to 1981, putting up good numbers despite poor run support. In 1980 he had a 3.44 ERA but only a 2-12 record due to the White Sox scoring 47 runs in his 23 starts. He pitched one season for the Pirates in 1982 but injuries ended up shortening his career. A fuller account of his career can be found at the 1980 Topps and 1983 Topps blogs. Where he is now: Vice President, Private Wealth Management at Robert W. Baird; Volunteer Pitching Coach at New Trier High School; Private Baseball Instructor at Elite Baseball Training, all in the Chicago Area. Interesting facts: In a 1986 afterord to former White Sox owner Bill Veeck’s autobiography, he recounts how Marv Samuel, a former White Sox minor leaguer working as a furniture store manager told him to sign Baumgarten, the son of the store’s owner. As a favor to Samuel they made Baumgarten the White Sox final pick in the 1977 draft. The next year he was in the major leagues. That 1986 book calls Baumgarten “an heir to the Baumgarten Furniture Stores“. However, a law suit last year, in re Estate of Baumgarten, shows that, though Robert Baumgarten promised his three children $1 million each in his will, Marlene, Robert’s wife of 40 years (presumably stepmother to Ross and his siblings?) ended up with sole custody of the Baumgarten fortune. The three Baumgarten children failed to win this lawsuit. Google Autocomplete results: He is third when you type Ross Bau, between Ross Baum, a writer, and Ross Bauer Bestowed, referring to the founder of an e-commerce company. There do not appear to be any other prominent Ross Baumgartens. Coming up next: The next profile will be Danny Bautista. I've seen lots of pictures of various goofy Studio cards over the years with parrots, bubbles, etc. But never this one with Jose Lind holding a freaking sword! This has got to be one of the greatest cards of all time and I'd never seen it before. He also finished my 1993 Upper Deck set and got me real close on a few others (check out my wantlists): 93 Donruss, 92 Pinnacle, 92 Ultra. John Roper gives this trade a thumbs up. Here's a card that would seem to accurately capture the player's personality. Finally, let's close it off with this great Don Mattingly shot. I recently got some cool rookie cards in Jaybarkerfan's Junk's epic contest. Tom Glavine is actually up for trade as I already have the entire 1988 Donruss set. 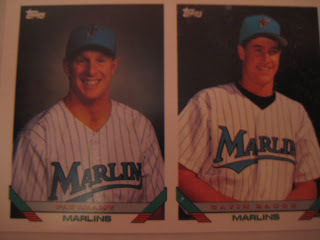 I have two cards of Justin Baughman. This one is from 1999 Topps. Playing career: Second baseman Justin Baughman played in 79 games for the Angels in 1998 and 2000, hitting .252 with 1 HR, 20 RBI and 13 SB. Google Autocomplete results: He is seventh when you type Justin Bau, between Justin Baum, a product design consultant in San Francisco, and Justin Bautista, a graphic designer in London. Another prominent Justin Baughman is Chief Videographer at WMFD TV in Ohio. Coming up next: The next profile will be Ross Baumgarten. I have two cards of Kenny Baugh. This one is from 2002 Topps. Playing career: Detroit’s number one draft choice in 2001, pitcher Kenny Baugh never made the major leagues, due to injuries likely caused by overwork while at Rice University. In 134 games in the Tigers, Marlins and Astros organizations, he went 47-43 with a 4.49 ERA. Where he is now: Anyone know where Kenny Baugh is now? Google Autocomplete results: He is third when you type Kenny Bau, between Kenny Baumgartner, a former NHL player, and Kenny Bauer, a financial planner in Philadelphia. There do not appear to be any other prominent Kenny Baughs. Coming up next: The next profile will be Justin Baughman. I have one card of Gavin Baugh, from 1993 Topps. Playing career: Infielder Gavin Baugh played five seasons in the Marlins organization. In 291 games he hit .220 with 8 HR, 82 RBI and 26 stolen bases. Where he is now: Anyone know where Gavin Baugh is now? Google Autocomplete results: He is first when you type Gavin Bau, ahead of Gavin Baumgardner, a doctor in Columbus. Another prominent Gavin Baugh is a physical therapist in Phoenix. Coming up next: The next profile will be Kenny Baugh. I have one card of Rick Bauer, from 2003 Topps Total. Playing career: Rick Bauer pitched seven seasons in the major leagues for the Orioles, Rangers and Indians. In 187 games (10 starts) he went 11-14 with 3 saves and a 4.51 ERA. Where he is now: A pitching instructor at D-BAT in Dallas-Fort Worth. Google Autocomplete results: Rick Bauer does not appear in the autocomplete results. Another prominent Rick Bauer is a realtor in Iowa. Coming up next: The next profile will be Gavin Baugh. I have one card of Pete Bauer, from 1991 Line Drive. Playing career: Pete Bauer pitched six seasons in the Mets and Astros organizations, going 24-30 with 36 saves and a 3.51 ERA. Where he is now: Project Consultant at Window Concepts of Minnesota. Google Autocomplete results: He is eighth when you type Pete Bau, between Pete Bauchle, General Manager at CSM Corporation, and Pete Baur Pontiac, a Cleveland car dealership. There are no references to the ballplayer on the first page of results; most of the links on the first page refer to a musician. Coming up next: The next profile will be Rick Bauer. I have eight cards of Howard Battle. This one is from 1992 Upper Deck Minors. Playing career: Third baseman Howard Battle played thirteen seasons of professional baseball. He reached the majors with Toronto in 1995, Philadelphia in 1996, and Toronto in 1999. Overall he appeared in 29 major league games and 1,327 in the minors. Where he is now: Anyone know where Howard Battle is now? Google Autocomplete results: He is first when you type Howard Bat, ahead of Howard Batman Beyond, referring to a character in a cartoon. Another prominent Howard Battle is a retired Air Liquide plant manager. Coming up next: The next profile will be Pete Bauer. I have four cards of Allen Battle. This one is from 1996 Collectors Choice. Playing career: Outfielder Allen Battle nine seasons of professional baseball, making the major leagues with the Cardinals in 1995 and Athletics in 1996. He played in 108 games in the major leagues. Where he is now: Anyone know where Allen Battle is now? Google Autocomplete results: He is sixth when you type Allen Bat, between Allen Batista Cruise, referring to a Manhattan travel agency, and Allen Batteau, a business professor at Wayne State. Another prominent Allen Battle is a psychiatrist in Memphis. Coming up next: The next profile will be Howard Battle.